As a Network Creator, you canÂ manageÂ basic account and subscription information by signing in toÂ Ning.com. Here you can see a list of your Ning Networks and their active plans. You can also see your invoice history, see your account balance, pay an outstanding balance, and manage your payment methods. You can getÂ basic information about theÂ plans we offerÂ here. If you need to update your payment method, you can do so by signing in toÂ Ning.com. You can pay by credit card or PayPal. If you need to pay by a different method, feel free to contact us to get more information by submitting a ticket from the “Support” link of your network’s Dashboard. Just click the “Manage Payment Options” link then the “Add A New Payment Method” option to add your new credit card or PayPal account. You can upgrade your paidÂ planÂ or switch between monthly and annual billing by signing in toÂ Ning.comÂ and clicking on “Plans & Billing” tab. If you wish to downgrade or don’t see the option you’re looking for, feel free to contact us by submitting a ticket from the “Support” link of your network’s Dashboard. We’ll get back to you once we’ve processed your request.Â It’s important to note that we’ll back-date changes to plans to the date of your request, regardless of when it’s processed by our team, which will automatically make the appropriate adjustments to your account. Upgrading a plan will take effect right away. If you’re on a monthly plan, you will receive a prorated invoice for a partial billing period, if applicable. Payments for annual plans will be processed in full at their first billing. Downgrading or canceling a plan takes effect at the end of your billing term. You can get more information on our Billing and RefundÂ PolicyÂ here. Note thatÂ amounts in parentheses are credits back to you, not charges. All of your Ning Networks that are created with the same email address are bundled together in one account and billed on the same date to the same payement method. When we collect payment on your billing date, you will be sent a copy of the invoice to the email address you used to create your networks. If you don’t see the invoice in your Inbox, be sure to check your SPAM folder. If you’ve made changes to your plan on a network, you may receive a prorated invoice that isn’t on your normal bill date. Prorated invoices are charges for a partial service period as our billing system aligns with the changes to your account. When you start a new network, you will receive an invoice for $0.00 showing that your network is in a 14 day trial and you’re not yet being charged. 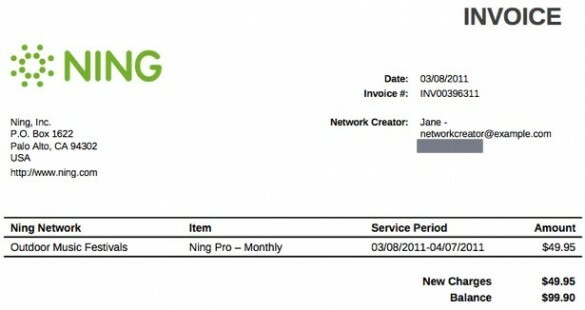 If you would like a copy of a previous invoice, the easiest way to get them is to sign intoÂ Ning.comÂ and click the “See Billing & Invoice History” link. However,Â we’d be happy to emailÂ an invoiceÂ to you as well. Just submit a billing ticket from the “Support” link of your network’s Dashboard. Be sure to include the service period for the invoice you’re requesting. Each time we attempt a charge on your account for an outstanding balance on an invoice and we aren’t able to collect payment, you will receive an email notification of a declined payment. Our billing system will automatically retry charge attempts on an account with an outstanding balance until the account is paid in full. You can learn what steps to take to if you’re receiving notices of declined paymentsÂ here. If you have an outstanding balance on your account or are seeing a red box onÂ Ning.com, you canÂ updateÂ your payment information orÂ process a paymentÂ by signing in toÂ Ning.comÂ with your Network Creator email address. If you think you were charged in error, we’d be more than happy to help resolve this issue. We ask that you contact the Help Center as an initial step, by submitting a billing ticket from the “Support” link of your network’s Dashboard, before disputing the charge with your credit card company or PayPal. We can often times quickly and easily explain a charge or correct an issue, however, once you dispute a charge with your credit card company or PayPal, the issue is out of our hands. The credit card company or PayPal will put a hold on your funds until they’ve completed their investigation, so we can no longer assist with any necessary refunds. 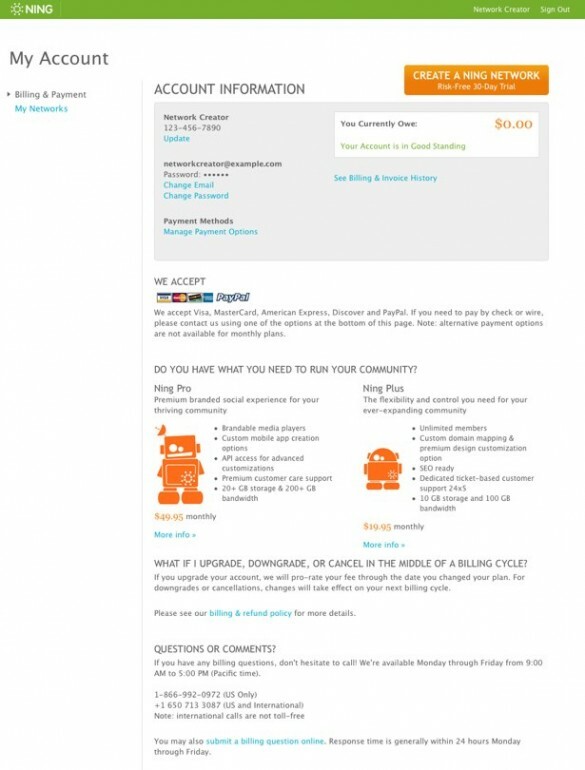 Furthermore, simply canceling a credit card or PayPal account to prevent further charges also prevents Ning from issuing any refunds or making adjustments to your account, if necessary, and could result in your network being closed. You can get more information on canceling the plan on a Ning NetworkÂ here. It’s important to note that deactivating your account through Ning.com or un-publishing your network does not cancel the billing plan for the network. You will continue to be charged until you submit a request to the Ning Help Center. 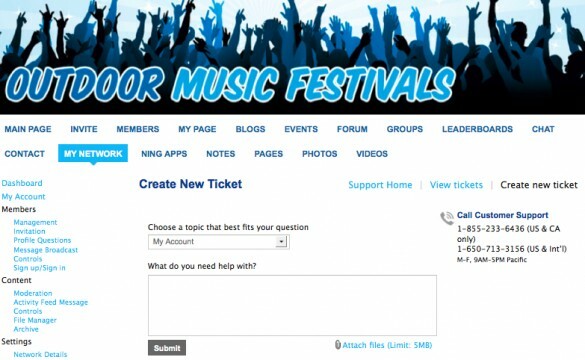 If you still have questions about your billing account, we’d be more than happy to help.Â You can submit a ticket by clicking the My Network tab to take you to your Ning Network’s Dashboard. 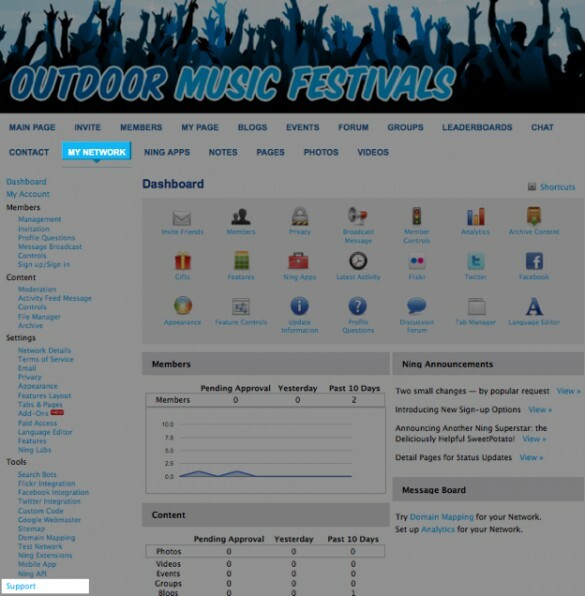 Next, click the “Support” link near the bottom of the left-hand side of the page. Finally, click the “Create new ticket” link, select “My Account” from the drop-down menu and describe the issue you’re running into below. Once you’ve contacted us, we may ask for information from your credit card statements or PayPal correspondence, so have those handy and ready to attach to your reply as a file orÂ screenshot. Be sure to gray-out any confidential information before sending it to us. Once we receive your question, we’ll work hard to get back to you and resolve the issue as quickly as possible.